Clever 2-way conductive clip for 4.5 - 6 mm (1/4") rope connections (not heavy wire). 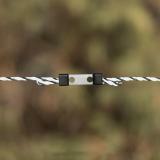 Electric fence repair has never been so easy. 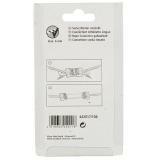 Insert rope ends into either slot and slide plastic clips into place. Look to 3mm Litzclip® for electric netting repairs. Cost effective, conductive and easy to use.